Linlithgow Rose boss David McGlynn admits his side face an “impossible” task in attempting to create what would be one of the greatest Scottish Cup shocks by beating Ross County this afternoon. McGlynn saw the capabilities of Jim McIntyre’s side in the flesh as he watched on from the Hampden stands last Sunday as Ronny Deila’s Celtic crashed to a 3-1 defeat. 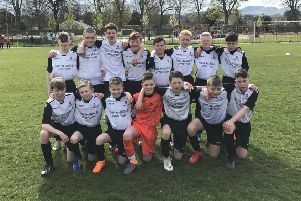 The Prestonfield gaffer was fully aware of the task in front of them as the part-time outfit – 35/1 outsiders to emerge victorious from their jaunt to the Highlands – set off on their trip to Dingwall this morning. “I would’ve liked to have been playing Celtic after watching them on Sunday,” said McGlynn, whose side edged Forfar 1-0 after extra-time in their fourth-round replay to become the first Junior club to reach the last 16. “Ross County are a tremendous football team. Jim has done a tremendous job wherever he has gone and credit to him because he’s got really good players. “He’s got them playing to his system. They are slightly direct and they play off second balls and they are very good at it. “It could’ve been 3-0 after twenty minutes on Sunday but County dug in and got their rewards. Rose welcome back Ruari MacLennan, Gary Thom and Chris Gray from suspension after they missed the trip to Forfar. McGlynn couldn’t do much with his depleted squad that night, having to play four strikers from the start. However, he has a full squad of 18 to choose from this afternoon. The Rose boss is aiming to keep things tight for as long as possible against top-flight opponents and hopes to do better than County did against Celtic after they conceded inside the first minute. “The boys need to be on their toes from the first minute to know what we’re doing, what the gameplan is and know how we’re going to play,” he said. “Gradually, we can get ourselves in the game and maybe frustrate them. It’s going to be hard, hard work that’s for sure but I’ve got players in there that have all played senior football and this will probably be their biggest game in their career. But they’ve been there and done it before at maybe your Clydes and your Berwick Rangers. “It’s going to be very difficult for us to go and play our normal game because if you do that against a team like this it could be any score. If you want, be positive and go and have a go. “They’ve got better players than us, they’ve got full-time players. But, you never know, it could be an off day for them and they’re not up for it. That’s what we hope for. “It’s what dreams are about but in reality you’ve got to hold your hand up and say it’s probably impossible. “They’ve got good players and probably two or three of their boys on their bench could be playing week in, week out at the top level.